Benefits are a big deal when you're looking for a job. It's the reason companies like Facebook and Google offer loads of perks in an effort to attract and retain top talent. Nina Hale, a marketing company in Minneapolis, unveiled a new, eye-catching purr-k this summer. It's offering "fur-ternity leave," which allows employees to work from home for a week after they adopt a pet. Though it's not common, it may sound like a familiar program. 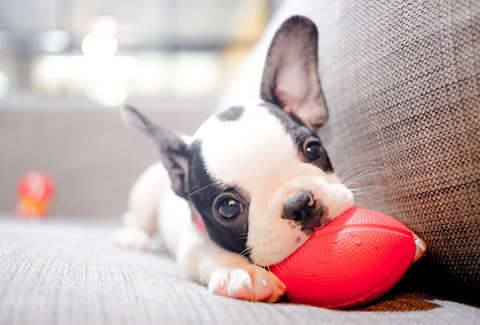 A Scandinavian pet food company instituted pawternity leave (fur-ternity by another name) earlier this year, and the New York-based data company mParticle offers this perk as well. "This is kind of a no-brainer," Allison McMenimen, a vice president at Nina Hale, told the New York Times. "The idea of offering benefits that just help keep employees at the office, that’s over." The program developed when Connor McCarthy, a senior accounts manager at the company, adopted a Goldendoodle named Bentley in May, reports the Times. He requested time to work from home to help Bentley adjust to his new life knowing that the first week or two is an important part of the transitional period. The request was quickly approved, and a couple of months later it was included in an overhaul of employee benefits. "We realized that we had received these requests a couple of times, and we thought, for so many of our hardworking, dedicated employees, there’s an opportunity for us to reciprocate their dedication and give them additional flexibility when they’re making a major life change," McMenimen told St. Paul's Pioneer Press. "And in this case, instead of a human baby, it’s a fur baby." It's a desirable perk and, unless your boss is a complete Montgomery Burns, McCarthy showed it can't hurt to ask.